In a simple, moving event, the Protocol to Ensure Language Rights, also known as the Donostia Protocol, was presented to the public today in Donostia. Paul Bilbao, the secretary general of Kontseilua, said in his speech that this protocol is a practical exercise in historical empowerment in which social entities have demonstrated their ability to create an effective tool to meet the challenge of safeguarding the rights of Europe’s minority languages. The Protocol project is sponsored by Kontseilua and the Donostia 2016 Foundation. There was a full house at the Kursaal conference centre, the organisation having run out of invitations several days in advance. The first speakers at the ceremony, in which speeches were punctuated by music and dance, were Aureli Argemi and María do Pilar García, co-authors of the Barcelona Universal Declaration of Linguistic Rights 20 years ago, who reminded the audience that the Barcelona declaration is the predecessor of the Donostia protocol. Xabi Paya, the director of the cultural programme of DSS2016EU, said that the Donostia Protocol is an important landmark for multilingual coexistence in Europe, and that thanks to projects like the Protocol to Ensure Language Rights, Donostia’s contribution to Europe’s identity through sustainable management of language diversity will be remembered positively in the history of Europe’s capitals of culture. The Protocol was developed under the guidance of the six European organisations that made up the Organising Committee, representatives of each of which received a token of appreciation for their impressive work. Joan Mari Torrealdai spoke about the lesson to be learnt from the arduous series of obstacles that the Basque language has had to overcome down through the centuries, stressing the role played by different generations, collectives, cooperation and mutual assistance in developing a nation, a culture or a language. 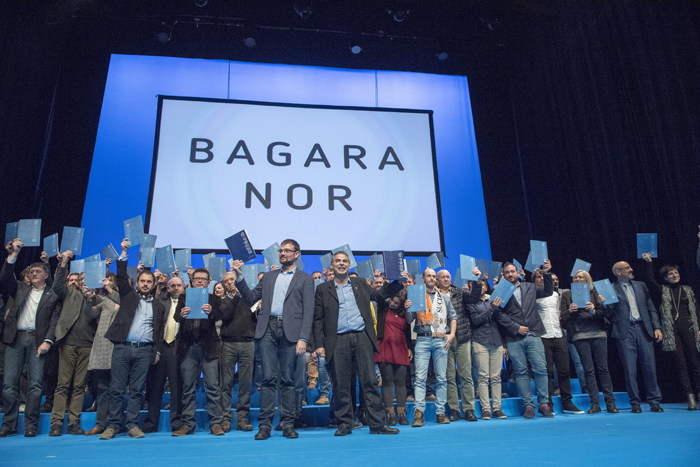 Then dozens of entities from Euskal Herria and elsewhere went up on stage for a group photograph, all holding the protocol document. Now they will each go back to their own language community hoping to build a more diverse, fairer, more equal Europe. The ceremony ended with everyone singing Mikel Laboa’s emblematic song Txoria Txori.